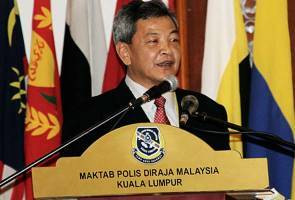 "Apa dosa Tun Mahathir sehingga tergamak saya memfitnah beliau? Jessica Gurmeet of the Attorney General's Chambers with 20 years loyal service to the Government of Malaysia and Dato Abdul Hamid Bahador the Deputy Director of the Special Branch with over 30 years loyal service in the Police Force are the latest to join the growing list of 'Enemies of the State'. This list is growing longer by the day. "ENEMIES OF THE STATE" ( to varying degrees - this is my view only ok, this is NOT an official list, jangan panic, jangan marah ). The Opposition is not included because it is always assumed that the Opposition is an Enemy of the State, except Hj Bawang.